Au Bon Vieux Temps by Guerlain: launched in 1890. Created by Jacques Guerlain. The name means "The Good Old Times." So what does it smell like? It is classified as a unisex, deep oriental chypre with violet, rose, (potpourri jar scents) and amber notes. It was described as "musky". "In the foyer there was a whiff of Guerlain's Le Bon Vieux Temps that recalled a summer breeze laden with the hearts of flowers. It is I hear the latest pleasure of Madame la Mode." "The list would be too long of all specialties of the Guerlain house dating from 1788. We only mention among the many products that contained his living room the old creations: Excellence, Héliotrope Blanc, Impérial russe, Pré d'automne, Eau de Cologne Impériale, la Poudre de Cypris, la pâte royale, and among all the recent creations La Gavotte, summer scent, very fresh, Jardin de Mon Curé, Le Bon Vieux Temps, l'eau de Cologne hégémonienne, l'Extrait de pot pourri aux plantes marines, Voilà pourquoi j'aimais Rosine. All these fragrances were exposed on consoles and pedestal tables and presented for some naked to show the intrinsic value of the products. Guerlain manufactures exclusively luxury perfumery. 'What a delicious fragrance', my dear, said I, because she smelled of that delightful perfume Bon Vieux Temps that I recognized immediately, as I use it myself. "My congratulations on your taste, dear friend, it is quite simply perfect. Do you like mine?" I added, shaking out my lace handkerchief, also perfumed with Bon Vieux Temps. "My goodness, yes" she murmured, blushing, caught in her own trap. "And I can't even hide from you where I bought it because you know I only wear Guerlain." "Guerlain ha realizado en su Bon Vieux Temps un difícil problema que consiste en darnos un perfume acentuado según el gusto del día atenuando su fuerza penetrante bajó la suavidad amable del olor. Estas son las cualidades raras que han consagrado la boga del Bon Vieux Temps y le han hecho adoptar por la aristocracia parisiense." "Guerlain has done in his Bon Vieux Temps, a difficult problem which consists in giving us a pointed perfume according to the taste of the day, reducing their penetrating power down to the gentle softness of smell. These are rare qualities which have enshrined the vogue of the Bon Vieux Temps and made it adopted by the Parisian aristocracy." "Here is another perfume with the charming name Le Bon Vieux Temps. Are there more words needed to create for you great grandmother's time with its potpourri jars and its hoopskirts its little elegancies and its faded sweetnesses?" "With his most respectful compliments Guerlain calls the attention of his fashionable customers to the following list of his productions Parfums pour le Vaporisateur : Eau de Cologne Hégémonienne, Quand vient l'été, Eau de Cologne, Eau de Toilette Gardénia. ... Après l'Ondée, Sillage, Bon Vieux Temps, Jicky, Chypre de Paris, Tsao-Ko.. Sapoceti, savon pour la toilette. Crème de fraises." Housed in the Empire flacon (parfum), the Louis XVI flacon (parfum), and the Goutte flacon (eau de toilette). 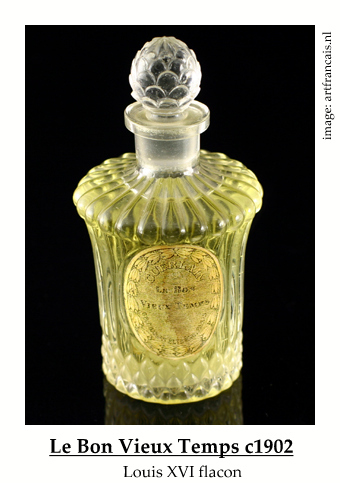 Relaunched in 1901 and renamed Le Bon Vieux Temps, and still sold in 1946. Discontinued.